If you know me well, tanning is never really on my to do list regularly. I always find self tanning really laborious, and nothing stays put on my pale skin. When the team at Skinny Tan got in touch. telling me all about their 1 hour tan mousse I was intrigued. The products arrived, and as usual I put them to one side and thought to myself "I'll do that one weekend, when I've got the time"
So who are Skinny Tan? 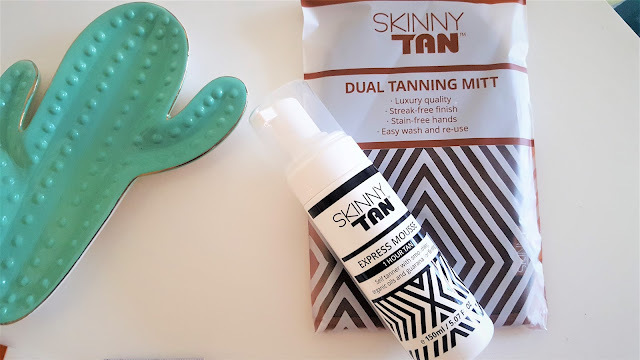 Featured on Dragons Den, the Skinny Tan brand offers Vegan products, with the Express Mousse being the 12th product in the range! Made with natural oils and firming guarana berries Skinny Tan Express Mousse lets you express yourself and choose the level of your tan. Leave it for 2 hours and get the deeper darker mousse Dark effect. Tan in 1 hour - lasts for 14 days straight. 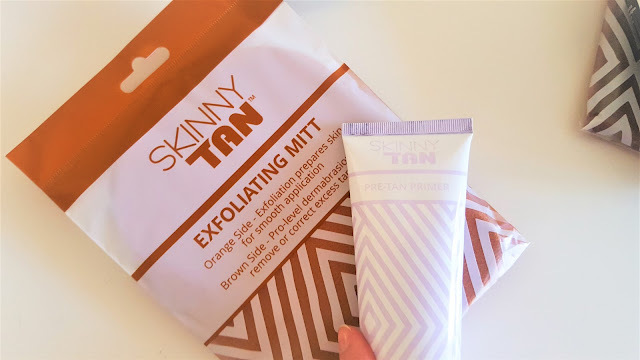 So I was kitted up with the Skinny Tan Pre-Tan Primer, and the matching Exfoliating Mitt. I ran myself a bath, soaked in the bath for 10 minutes and then I used the Orange side of the Exfoliating Mitt to buff off any dead skin, I squeezed out about a 50p sized blob of the primer and applied it to my partially wet skin. 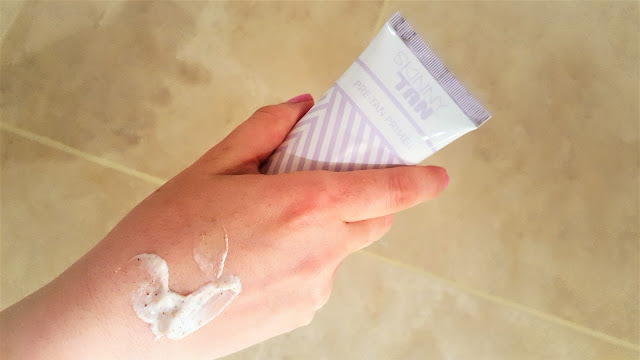 The Pre-Tan Primer smells of holidays, with it's fresh coconut scent - I absolutely loved it! It went on really well, and I popped back in the bath to wash off the residue. I could feel how silky smooth my skin was straight away! 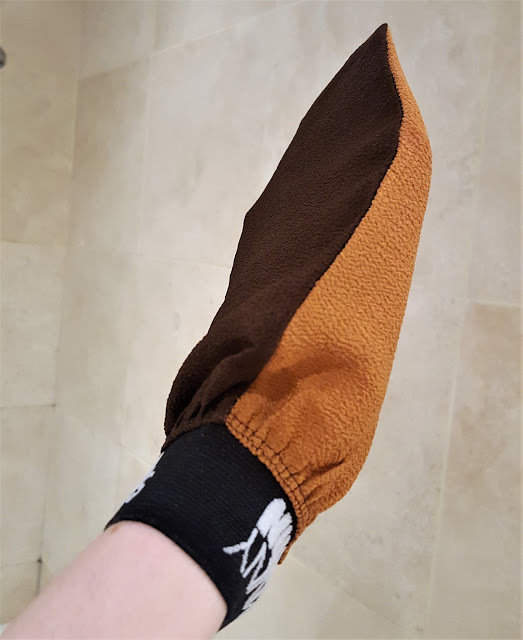 The mitt being double sided offers double usage, because the dark brown side you can use once your tan has disappeared, to prepare your skin for another application of Skinny Tan. Once I was out of the bath I dried my skin, and applied a little moisturizer to my elbows and knees so that they weren't too dry and would soak up the express mousse too much. I then shook the express mousse and squirted the right amount of product onto the Dual Tanning Mitt. This mitt is luxurious and has to be the most luxurious tanning mitt I have ever used! It simply feels like a velvet glove, you spread the Express Mousse using this mitt and your skin simply lets the tanning mousse sink straight in. The velvet texture of the tanning mitt means that you get an even application, without any streaks. Here's my lovely sausage legs for you! The left leg has had one application of Skinny Tan Express Mousse and the right leg has had nothing. 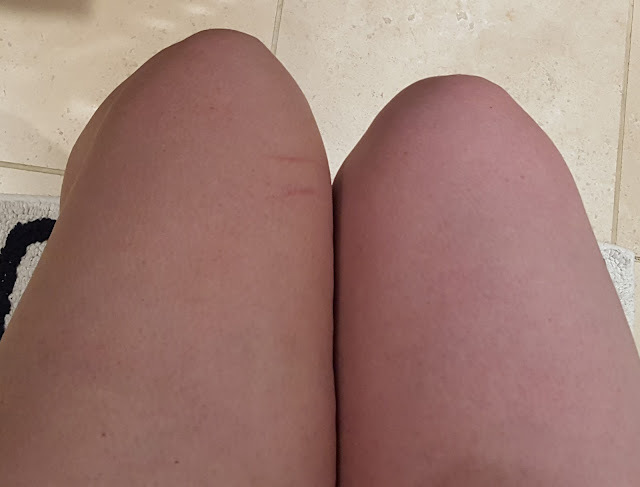 It might not be clear in this photo but my gosh you could see a difference instantly! I made sure that I covered as much of my body as I could on my own, and then I went to bed. The next day, I always worry about showering because I feel as though I'll wash all the tanner off of my body, but I needn't of worried!! The Skinny Tan Express Mousse is the best tanner I have ever used!! Bold claim indeed, but I felt confident, bronzed and looked a whole lot better thanks to this tanner! What's more it lasted for a good 4-5 days, and the amount of compliments from my colleagues only backed up the fact that this product is amazing. I am definitely going to re-purchase The Skinny Tan Express Mousse again. I have never had such an even luxurious colour before! 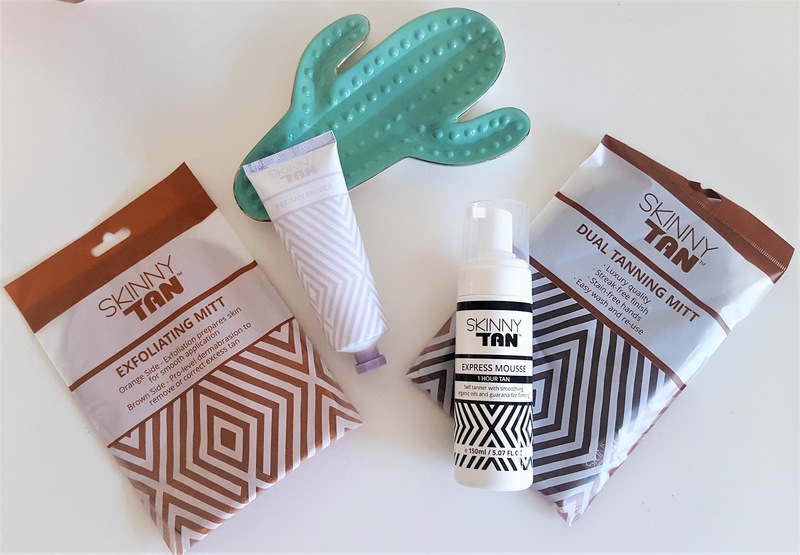 Have you heard of Skinny Tan?